Microblading, Microshading, and Microfeathering What’s the Difference? Written by Flash Brows on October 11, 2018 . Posted in Blog, Microblading. Eyebrow makeup is one of the top trends in beauty right now, so it can be hard to keep up with all the latest techniques and treatments. Microblading is a new-ish 972-804-4555 that applies tiny, hair-like pigments to the brow area for a natural appearance. After microblading, microshading and microfeathering grew in popularity. To learn the difference between these three eyebrow treatments, just continue reading. Microblading is the mother of microshading and microfeathering. Microblading is the ideal semi-permanent makeup procedure for those interested in natural, long-lasting brows. Microblading uses a fine blade, with even smaller blades on that blade, to deposit pigments into the skin. The pigments are not applied as deeply as a tattoo, so they fade after one to three years. This allows individuals to keep up with eyebrows trends. It is also less intimidating to get this procedure done knowing the results won’t last forever. The thin strokes of microbladed eyebrows resemble natural hairs, so it looks as natural as possible. An artist can even use a pigment that matches your natural brow hairs, or a pigment that is slightly darker to add a flattering tint. Microfeathering is a form of microblading that is lighter and fluffier in appearance. If you already have thick or dark eyebrows, you can use microfeathering to fill in the brows for a more put-together and cohesive look. While microblading creates a new brow shape for you, microfeathering just fills in the brows you already have. Microshading is a form of semi-permanent eyebrow makeup that appears more “done.” While microblading is meant to look natural, microshading is meant to look more like eyebrows that have makeup on them. Microshading artists use a manual or electric hand tool to create a soft, powdered effect similar to eyebrow powder. A stippling method is used to apply the brows, resembling pencil strokes or pomade. If you want to wake up everything single day with eyebrows that look like you’re wearing makeup, microshading is an appropriate choice for you. 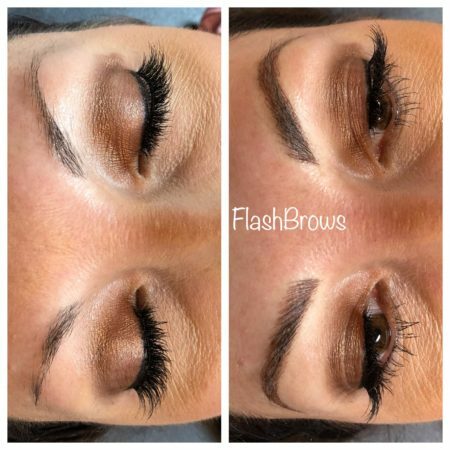 To receive microbladed eyebrows that appear natural, yet flattering and attractive, consider Flash Brows by Heather Gordon. Check out our website or call us at 972-804-4555 for more information about our services.